Our relationship with Diversified dates back nearly ten years having advised on the execution of several buy-side acquisitions, refinancing’s and growth equity investments. 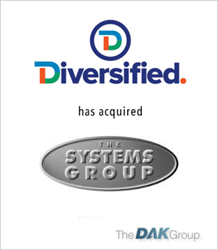 The DAK Group, a leading investment bank specializing in middle-market mergers and acquisitions worldwide, announces the acquisition of The Systems Group (TSG), of Hoboken, NJ, by client Diversified Systems, (Kenilworth, NJ). The DAK Group served as exclusive investment banker and financial advisor to Diversified leading the negotiation due diligence, and ultimate closing of the transaction. The Systems Group (TSG) acquisition expands Diversified’s presence in the broadcast integration market and provides an internationally recognized firm with a strong reputation for consulting, design, and integration around broadcast-LAN architecture. The TSG acquisition comes on the heels of Diversified’s acquisition of Technical Innovation (TI), of Norcross, GA, creating an industry powerhouse offering a broad spectrum of media solutions with over $400 million in revenue and 800 employees in 22 offices across the US. Diversified is an industry leader in custom solutions and managed services for a broad spectrum of media delivery challenges. They specialize in the use of technology for complex and scalable professional broadcast, corporate communications and digital signage networks that provide businesses with the enhanced capability of creating, managing and monetizing original digital content. Since 1984, The DAK Group has executed hundreds of transactions across a wide range of industries, including food, industrial, manufacturing and distribution, telecommunications and technology, business services, packaging, consumer products and healthcare. As a leading investment bank exclusively serving the middle market in the areas of buying and selling businesses, financial restructuring, capital advisory, valuations and fairness opinions, DAK offers a propriety process that allows clients to maximize business value.